I was asked to make a retirement card recently, so I made several, and I'll share one with you today. I began with a piece of vanilla card stock, sponging some antique linen ink through a SU! brick stencil just in the center of the panel. Next I used a Cuttlebug "clockworks" embossing folder, then used an aqua brush and several inkpads to add watercolor stains. The metal clock hands and brad are from Tim Holtz - something I've been hoarding for years! The sentiment is from the MFP stamp set "Take Time to Live" and I heat-embossed it with gold on an espresso snippet of card stock, then tore it around the edges to age it a bit. The inside simply says "Happy Retirement" and it's on an early espresso card base. I'm sharing this with the Happy Little Stampers January Watercolor challenge which is anything goes with texture. Thanks for stopping by and make it a great weekend! Always take time to live - life is short! 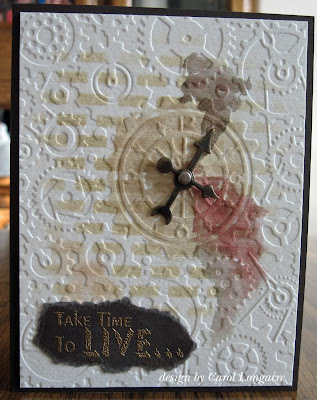 Great sentiment, love how you have used the watch and great embossing folder. Fabulous choice of EF and stencil mixed together into this stunning design, and the TH clock hands are just perfect!! Love the aged sentiment, another perfect detail! A super card Carol, a great design for a retirement card. Carol, this is so different, yet so beautiful! I love the embossing and the way you did the watercolor stain. Gorgeous card! It looks like extra texture with the stenciling and embossing. Great idea for a retirement card. What a simple but stunning card here Carol. 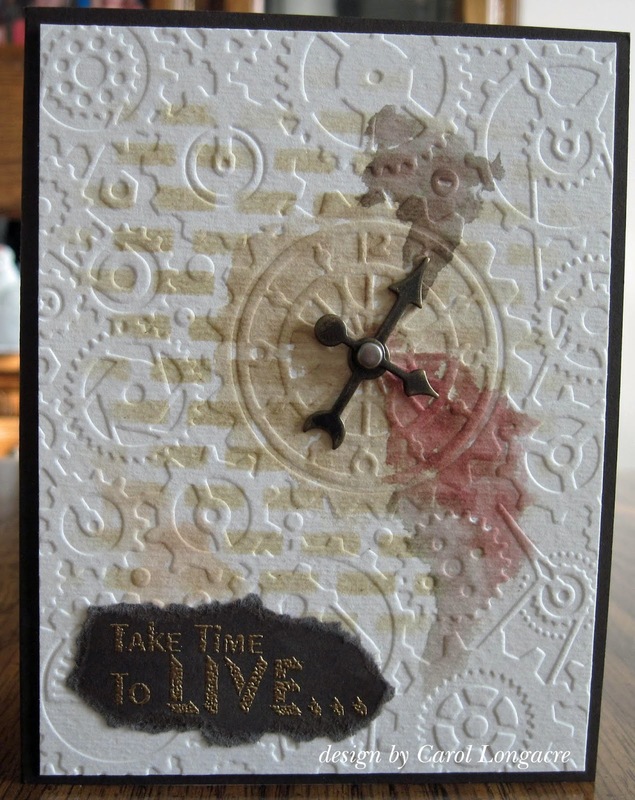 Love the stencil colouring,the embossing and what fabulous watercolour stains you have added. Funny how we finally use something in our stash we have had for years and it finally has a home - perfect here. Love the torn sentiment. Can't wait to see more! A great retirement card. I love the clock and the hands you added. And, all that texture is awesome. WOW that gear texture is awesome!!! You keep telling me you have no card mojo, but here you are again with a creative masterpiece! I want your no mojo, please! Nice work! A great retirement card! Thanks for joining us at Happy Little Stampers Watercolor Challenge.